The AirFit™ F10 for Her full face mask is available in 3 sizes and comes with plush pink headgear for added style. 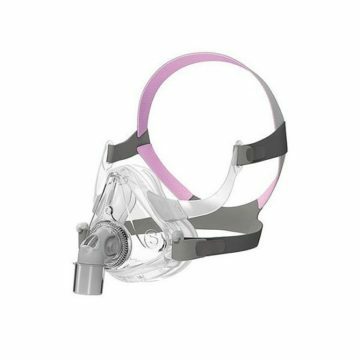 This light weight and compact mask is comfortable and practical. With it’s unique design your line of sight isn’t when you’re wearing it, so you can wear your glasses, read or watch TV in bed with your mask on. The AirFit F10 for Her Women’s variant, for a more tailored therapy is small and lightweight, making it more comfortable to use on a daily basis. The Spring Air™ cushion is soft and fits comfortably on your face, while the SoftEdge™ headgear, in plush pink, features slimmed-down straps for maximum comfort and fewer facial marks. With just four parts, the AirFit F10 is fast and easy to reassemble and clean. Circular diffused venting gently directs exhaled air away from you and your partner — creating a quiet, peaceful sleeping environment. 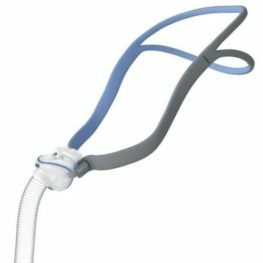 The quick-release elbow with side buttons allows you to easily detach the mask from the tubing, making it more convenient to get up during the night without removing your mask. 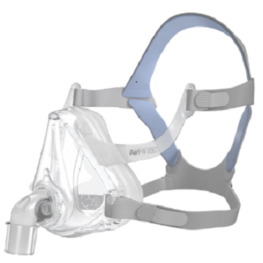 Be the first to review “ResMed AirFit F10 Full Face Mask For Her” Click here to cancel reply.